Thermage is a safe, clinically proven way to tighten and contour skin, with visible improvements in tone, contour, and texture occurring naturally through the stimulation of your own collagen. 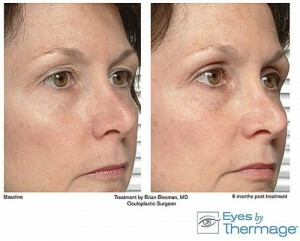 Thermage is completely non-invasive: no surgery, no injections! A single treatment tightens your existing collagen and stimulates new collagen growth. Improvements are both immediately visible and continue up to six months. Results can last for years depending on your skin condition and aging process. The Thermage procedure is available only in the offices of qualified physicians who specialize in cosmetic procedures. The procedure itself is done as a single treatment that takes from one to two hours depending on the treatment area. What’s more, there is no downtime, so you can quickly resume your normal routine. Unlike lasers, Thermage works on all skin types and tones. And unlike injections or fillers, Thermage works on your entire face: forehead, eyes, nasalabial folds, jaw line, jowls and the area under your chin. Thermage sends radiofrequency (RF) technology to safely heat the deep layers of your skin, while cooling the surface of your skin to keep it intact during the procedure. Do you find that you no longer look as young as you feel? If the mirror doesn’t reflect the way you feel on the inside, now there’s a way to turn back the clock. With Thermage CPT™ many patients have seen smoother, tighter skin with less sagging, redefined contours of the jawline and neck and softening of wrinkles around the eyes, mouth and forehead. Unlike lasers, the Thermage CPT™ Face procedure works on all skin types and colours. Tummies, knees, legs and arms are areas that can show signs of aging. The Thermage CPT™ skin tightening treatments are designed specifically to help smooth and tighten wrinkled, crepey and sagging skin on these body areas. Many patients have seen flatter, smoother skin on the tummy, legs, knees, buttocks or arms, tightening, firming and lifting, reduction of crepey skin and smoothed dimples for temporary improvement in the appearance of cellulite. Thermage CPT™ skin tightening treatments are a singular treatment with no downtime and results that continue to increase over a 6month period and last for 2-3 years. The CPT™(Comfort Pulse Technology) provides more results and increased comfort all in a shorter period of time, as compared to the former Thermage technology. In Clinical studies, 100% of patients preferred being treated with the ThermageCPT™ system versus treatments with prior technologies. With this treatment, everyone can expect to some collagen tightening. Tummies, knees, legs and arms are areas that can show signs of aging. The Thermage™ treatments are designed specifically to help smooth and tighten wrinkled, crepey and sagging skin on these body areas. Many patients have seen flatter, smoother skin on the tummy, legs, knees, buttocks or arms, tightening, firming and lifting, reduction of crepey skin and smoothed dimples for temporary improvement in the appearance of cellulite. Eyes by thermage is the only procedure that smooths and tightens skin, decreases wrinkles and hooding in the eye area without surgery, injections or downtime. ThermageCPT™ delivers gentle but noticeable skin lift and tightening which provides a simple robust solution for thousands of people seeking a safe way to tighten sagging skin without surgery. Many Clients have seen younger, more lifted eyes where the eyes look brighter, smoother eyelid skin where make up can be applied easier, softened fine lines and crow’s feet and reduced hooding with tauter, smoother contours around the eye.